This is a home built for luxury and fun at the beach! The 6 bedroom home features TWO oceanfront master suites, TWO additional large king suites and two guest suites both with double queen beds! All bedrooms have en-suite baths and no detail was overlooked! TV’s in every room, high end beds/linens, luxury decor and more. The home sits in a private/gated community with paved road access and security. 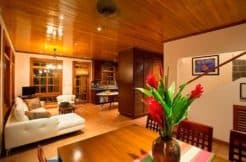 Situated on a bluff overlooking the gorgeous Bahia Tamarindo (Tamarindo Bay), the views are magnificent and your access to the beach is a 1 minute stroll down our private path to the best part of Tamarindo beach. A two minute walk down the other private path puts you onto either directly onto Playa Langosta’s white sands or the adjacent point/headland with stunning views! On the ocean side of the home you’ll find plenty of room to spread out and enjoy your corner of paradise…outdoor dining, bocce ball, a custom “corn-hole” setup, hammocks and comfy chairs let you take it all in right outside your home. The home’s slight elevation allows for commanding views of the beach and bay while also giving guests natural privacy from the few folks who do choose to walk down towards this part of the beach/bay. Town is a short walk (10-12 minutes on the beach) or a three minute drive, providing easy access to all of the shopping, restaurants and nightlife that “Tama-Town” affords…while the closer/quieter Playa Langosta plays host to a number of excellent dining options as well! The home was designed for large groups to feel at home with plenty of room to spread out and enjoy their time in paradise.